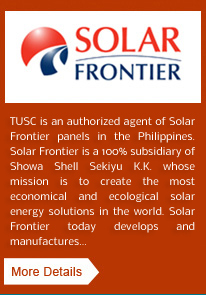 Over the years, Transnational Uyeno Solar Corporation (TUSC) has evolved to become among the country's most reputable solar energy companies, consistently committing to providing clean power and building a sustainable, clean and green world. 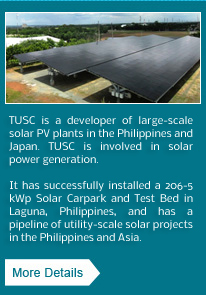 Built on hands-on experience and high quality service, TUSC has since distinguished itself as having built The Philippines' first-ever solar photovoltaic (PV) car-park -- currently the third largest solar installation in the country. The 206.5 kWp car park, located in Canlubang, Calamba City has given TUSC the first-hand experience in constructing, installing, operating and maintaining a solar PV plant, due to the management expertise, skills and qualifications of its people to meet the ever-changing needs of its clients. 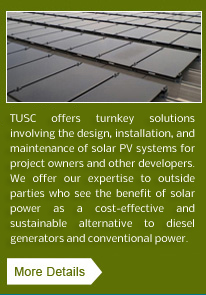 TUSC has installed and commissioned both large- and small-scale solar PV systems in a timely manner and compliant with the safety, design and aesthetic parameters of its clients. TUSC ensures that it utilizes high-quality components and partners with top tier contractors and suppliers at cost competitive prices to maintain long-term performance of its installations. TUSC supports clients from due diligence until post-commissioning to ensure that the systems are optimally designed and are operating as expected.